Hi blog hoppers!! 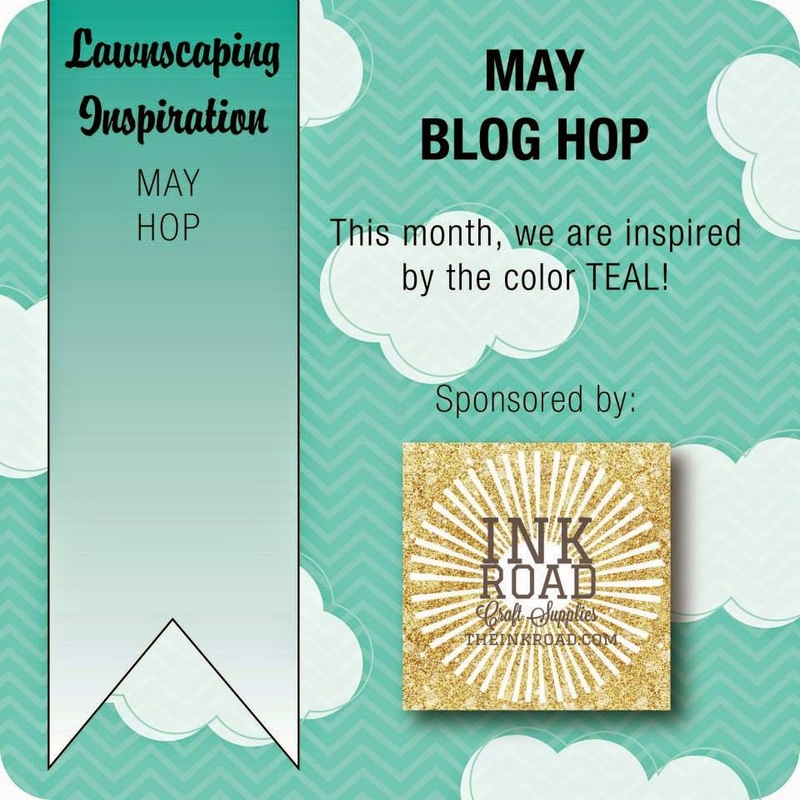 Welcome to my blog and another monthly blog hop featuring the Lawnscaping Facebook Inspiration Team aka FIT Team :) This month we are inspired by the color Teal! I think this hop in particular this month will be a popular one, because this color is a happy one, and it seems a lot of us love this color! It is one of my favorite colors no doubt!! Before I get into the details of my card - you should arrived to my blog by the way of the talented Isha - no doubt I am sure that she had something fantastic!! What a talent! I started my card by stamping my background which is from Argyle Backdrops - another one of my favorite background stamps from LF. I used two colors of Teal ink, both from HA - Mint Julep and Tide Pool. I stamped that onto my favorite white card stock - PTI stampers select white card stock, and I stamped enough to cover the card stock so I could die cut the panel with the Largest Stitched Rectangle Die from LF. 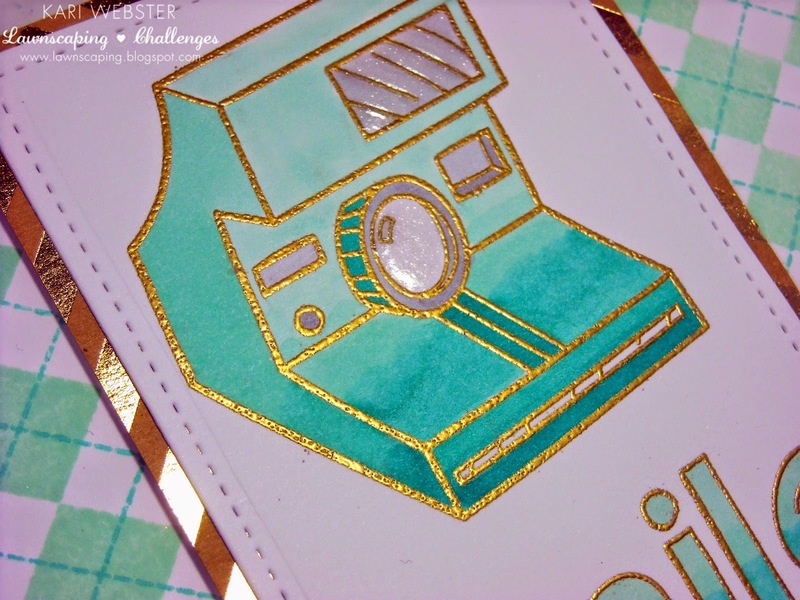 Once my background was done, I die cut another smaller panel with the same die set, and stamped my camera, as well as my sentiment which are the letters from Quinn's ABC's and I stamped them with Versa Mark ink, and them heat embossed them with Gold Embossing powder. I colored both my camera and my letters with 4 shades of teal of Copic Markers - BG10, BG11, BG13, & BG15. I colored them with an ombre' effect in mind. Once I was satisfied with how it looked, I moved onto the camera lens, and flash area of the camera, and I colored those areas with grays - C1 & C3. I also added some shimmer with some Wink of Stella, and Clear irRESISTible Pico Embellisher. I created a mat for my colored panel with a piece of the foiled card stock from the Bazzill Basics 6x6 pad. And, here is a closer look at the details of the camera. I liked how it turned out!! 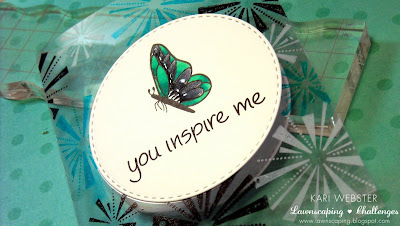 I hope you do too, and it inspires you to get those older stamp sets out!! I can't forget to give a shout out to our monthly ( and awesome) sponsor - Lara Smith from The Ink Road. She has a wonderful shop on Etsy if you haven't checked it out yet!. Be sure to leave a comment along the way and have a chance to win a gift certificate to her shop!! So - its time move along to Lenny and her amazing project for you!! If you get lost along the way - below is the hop order!! Have fun on the rest of the hop!! Square Shaker Card + Video! Good Afternoon!! 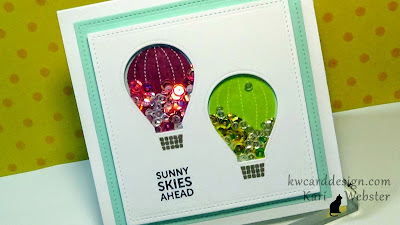 Today, I am bringing you a shaker card tutorial. I love shakers - they are so much fun, and the possibilities are endless when it comes to making them, and what you can put in them. No wonder they are so popular. 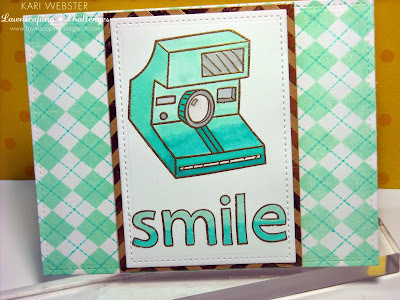 For my card today I am using Mama Elephant's Sunny Skies stamp set as well as sequins from Pretty Pink Posh. I recently picked up some of the new iridescent colors that Paulina has in her shop! I started out by die cutting a piece of my favorite white card stock and a piece of the Sea Glass Card Stock from Simon Says Stamp using one of the frames from the Small Stitched Square die set from Lawn Fawn, and then I used the coordinating balloon die from the Sunny Skies set, and die cut two balloons from my white panel to create my window panel for my shaker. 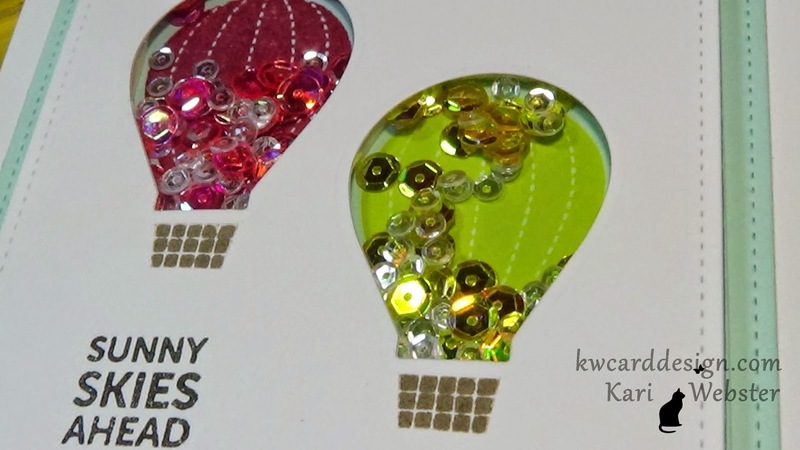 I, then stamped onto my Sea Glass card stock the balloons from the stamp set using Lemon Yellow ink, and Raspberry Jam ink, both from Hero Arts. I stamped the basket from the stamp set and the sentiment 'Sunny Skies Ahead' onto my white window panel. I then adhered a die cut piece of acetate to the back of my white panel to complete the window panel. Then, I covered the back of the panel with foam adhesive before adding some fun sequins. I added the Sunshine Glow and Strawberry Burst Iridescent sequins to my windows, and then I removed my foam adhesive backing papers to expose the stick side, and then I adhered my stamped panel. Success! Time to give it a few shakes! To finish the card, I die cut another piece of Sea Glass card stock with another square frame and adhered that to a 5x5 white card base. If you are interested in seeing how this one came together - I have the how to video below. Happy Saturday everyone! It is a long weekend here in the States - and I couldn't be happier about it!! I am thankful to all the men and women who serve and make sacrifices everyday for my freedom!! It doesn't go unnoticed!! So - I have posted two tutorials over at my YouTube Channel - and forgot to post them here. I am bad about that. I really need to post more over at my blog - it gets a little neglected :( I want to change that!! So - here are my latest two tutorials from last weekend, and plan to have new videos up soon! If you haven't subscribed and like what you see - I encourage you to subscribe - It's FREE!! And, you will be notified once a new video is posted! Have a great weekend!! Hi all!! 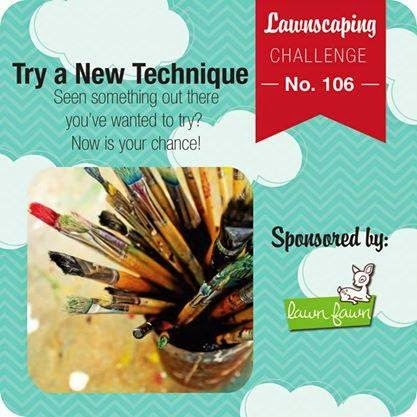 Welcome back to a new challenge with Lawnscaping Challenges! So is there a technique that you've always wanted to try, or even unsure of trying a new technique because you were not sure of how it would turn out? 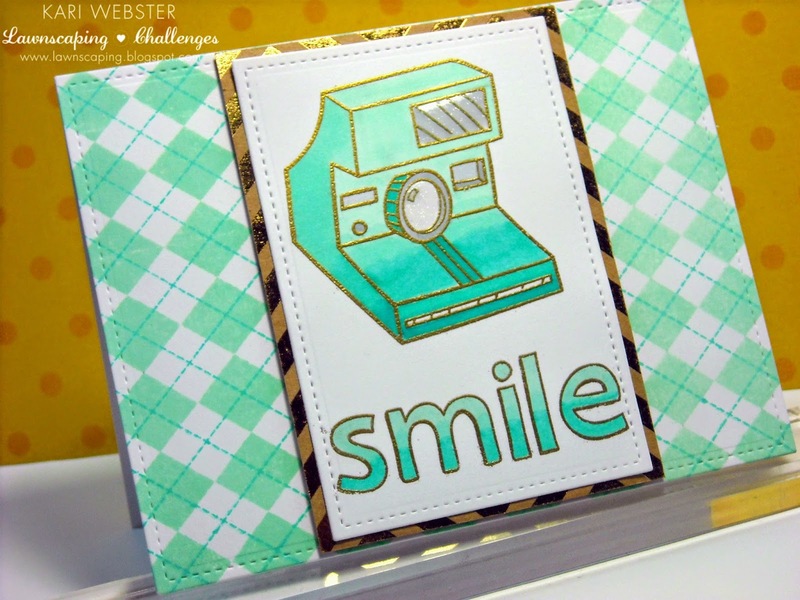 Well, this challenge is perfect for you to try THAT technique and link it up! It is a perfect time to play along and show our sponsor Lawn Fawn how awesome your project is!! They are giving away a $25 gift certificate to the winner!! Awesome, huh!? So - there are several techniques that I've wanted to try or had me curious - but the one thing I don't do often at all is make Acetate cards! Mainly - because of stamping on the slick surface has me nervous! But - I wanted to give it another try! I used 3 colors of Staz On ink I had to stamp onto my acetate card. The stamping isn't perfect - but that is alright :) I used Happy 4th and Flutter By for my card today. I also did some Copic coloring - I am not 100% happy with the coloring - only because of the color match - but I am sure this card will bring a smile to someone's face. I added some Wink of Stella to the middle of my butterflies wings, and then some clear Pico Embellisher for a glossy effect and dimension. 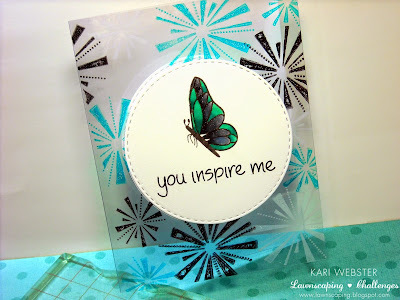 I hope this inspires you to try a new technique and to play with us over at the blog!! How's it going everyone! 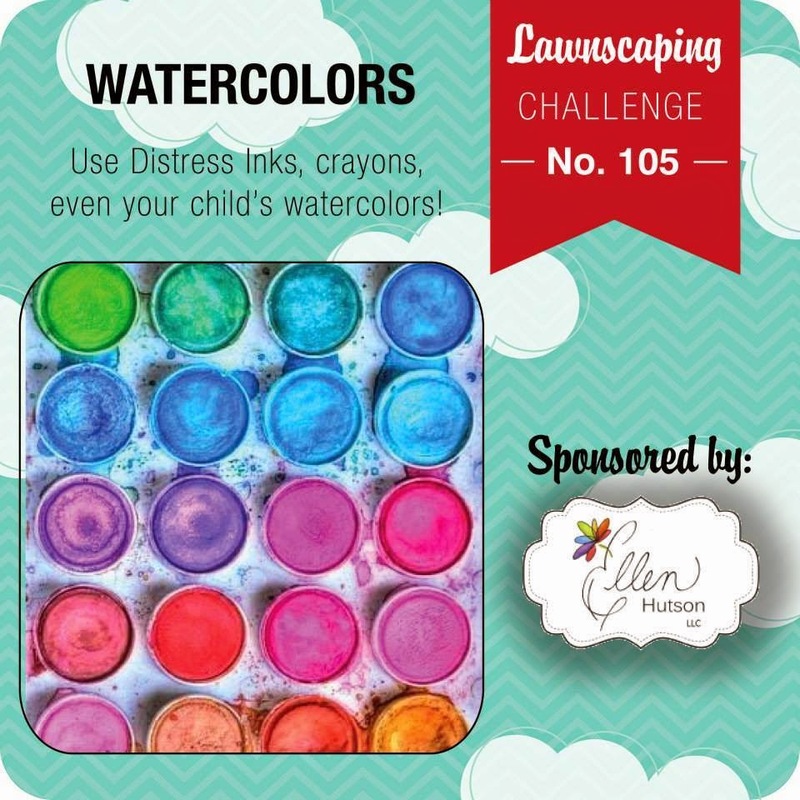 So we have a brand new challenge over at Lawnscaping - featuring Watercolors. If you love watercoloring with what ever medium - distress inks, pencils, traditional water colors, etc then this is a challenge you will enjoy getting creative for. I don't water color all that often, but I do like to experiment when I do. For my card I used Distress Inks - and I went with a traditional "ROYGBIV" - and for those of you that do not know what that means - that is the order of the color wheel - RED - ORANGE - YELLOW- GREEN - INDIGO, VIOLET. I love these rainbow set of colors - it is very pleasing to the eye. I wanted to get ink up the stamp set Color My World ( that was a Black Friday special from Lawn Fawn) since I hadn't yet since owning it. 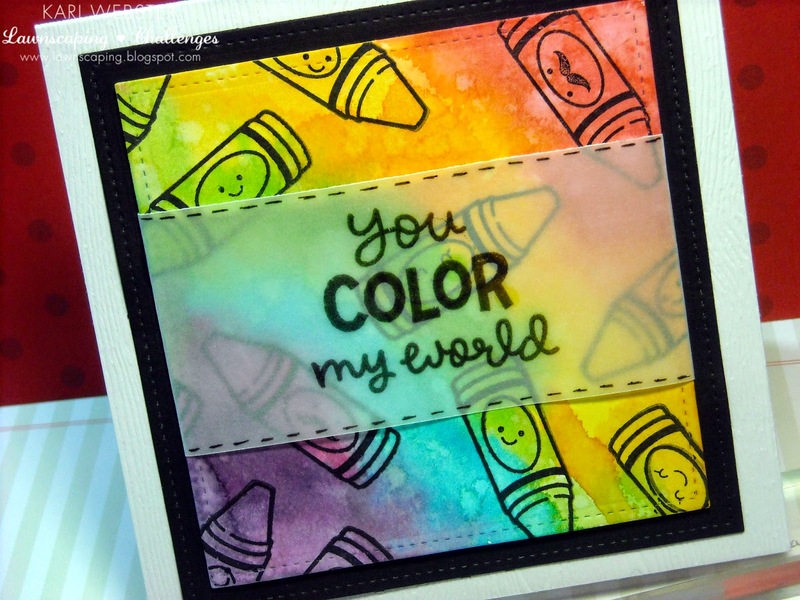 I stamped the crayons all over my die cut water color card stock piece, and used Staz On Black Ink for this. Since I was water coloring over the top, I needed an ink that wouldn't smear when water came in contact, and Staz On is a perfect ink. It is a crisp black ink as well. So I used Fired Brick, Mustard Seed, Spiced Marmalade, Mowed Lawn, Salty Ocean, Seedless Preserves and Dusty Concord for my Distress Ink Colors. Once I was finished water coloring and got it how I liked it, I used my heat tool to set it for a quick dry time. You could of course let it air dry as well. Then, I went in with some droplet of water to give it more of a water color effect and also heat set it. I added some foam adhesive to my main panel since we did use lots of water - there was some warping. For my sentiment - I stamped the sentiment from the same set in VersaFine Onyx Black and heat embossed it with clear embossing powder onto a piece of vellum. I didn't want to take away from my main panel so that is why I chose vellum. I adhered my water color piece onto a piece of True Black card stock, and then adhered that onto a piece of WoodGrain Card stock from SSS. 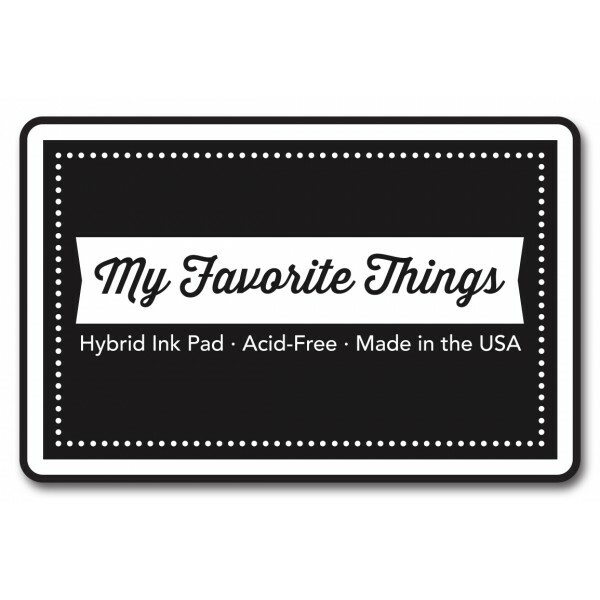 My card size is a 5x5 square card - I love this size! You can't tell from the photos, but I did add a little shimmer with my Wink of Stella to some of the crayons. 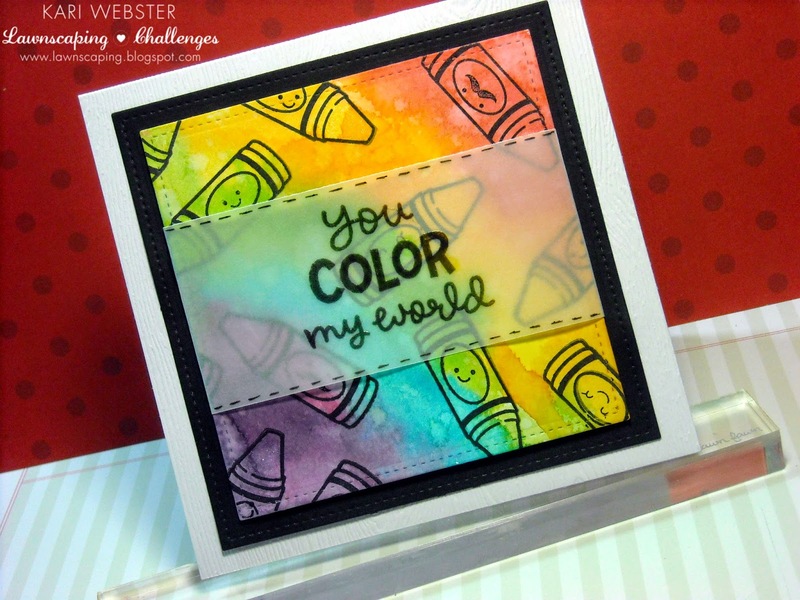 Be sure to get your water colors out, and join us for this fun challenge!! 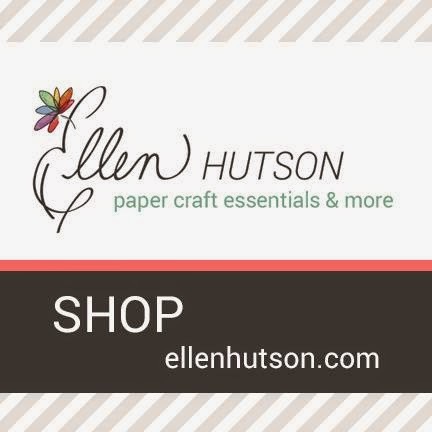 Our sponsor is the wonderful folks over at Ellen Hutson! There's a chance to win a $25 dollar gift certificate!! Hi! 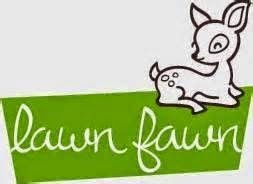 Welcome back to my blog - today I am following up with my Lawn Fawn Dye Ink Review to talk about the Black ink in this line. 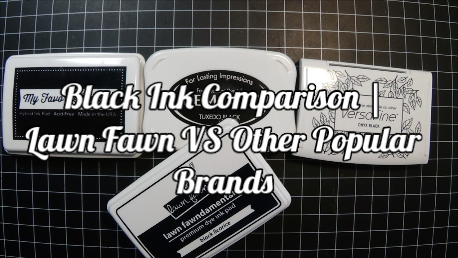 I promised I would do a separate video comparing the black ink with others that I own and how it "stacks" up on how it stamps, the coverage, and how it performs when using alcohol markers. Again, I am doing this is video form as I felt it was easier to cover more info that way in a short amount of time. 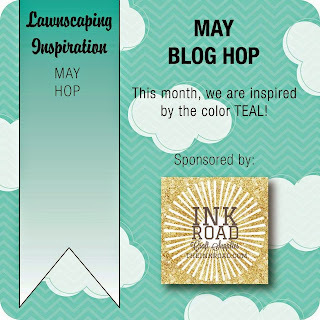 I have the video below, and just in case you missed my initial review of the other colors in the line from Lawn Fawn, I will have that video as well!! So - how do you think Lawn Fawn compared to the other black inks?? Hi!! 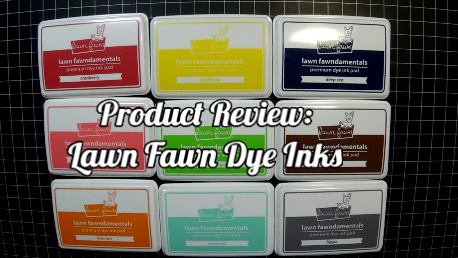 I've been promising this review on the Lawn Fawn Dye Inks for a few weeks now. I wanted to own all of them before doing the video so I could do a true and complete review! I've made a video since I felt it would be easier to do the review that way. I show you all the colors, and swatches of them, and my thoughts of what I think. I will have a another video dedicated to just the black ink in this line to compare with other popular black inks that I own. So, if you are interested in my thoughts on these inks, then the video is below! Any questions please feel free to comment, and I will be happy to respond!